When I started to put together my LGB garden railway, I quickly realized I would need some way to keep the track clean. The brass rails oxidize quickly outdoors, not to mention getting covered in bits of leaf and general garden dirt. Clean track with a bright, conductive surface is essential for smooth operation. It’s possible to clean track by hand, of course. I have about 100 feet of track - small by garden standards - and it is a thoroughly unpleasant and back-breaking job, shuffling around the garden on your bottom, scratching away at a couple of feet of track at a time. There has to be a better way. LGB have thought of this, and they give you two possibilities. One is a goods wagon with a couple of tiny abrasive pads on the bottom. Experience with even a small, indoor layout shows that these quickly wear out and get clogged. The Rolls-Royce alternative is the Track Cleaning Loco, styled after the yellow track maintenance vehicles you see all over the world. At least, originally they were yellow. When they introduced a DCC version, it became red. I found a used yellow one, pre-DCC, on Ebay. With the installation of my usual NCE decoder, it was good to go. It would trundle around the layout, its cleaning wheels grinding away and leaving fresh, shiny track behind it. Perfect. At least, for a couple of feet. Then it would stop - because the track was dirty. It has a very short wheelbase, so it only takes slightly uneven track plus a bit of dirt for it to be deprived of power. This is a problem for all locomotives, but for one whose job is to take care of dirty track it completely defeats the objective. As shipped, there is no control to turn on and off the cleaning motor. If you drive the loco forwards, it cleans as it goes, making a terrible noise that sends our cat scrambling for the fence. In reverse, it runs quietly and without cleaning the track. Neat, but not always convenient. Early in its life, it had a disaster. While I was tinkering with it, body removed, a loose wire touched the track, shorting the track power to the motor. 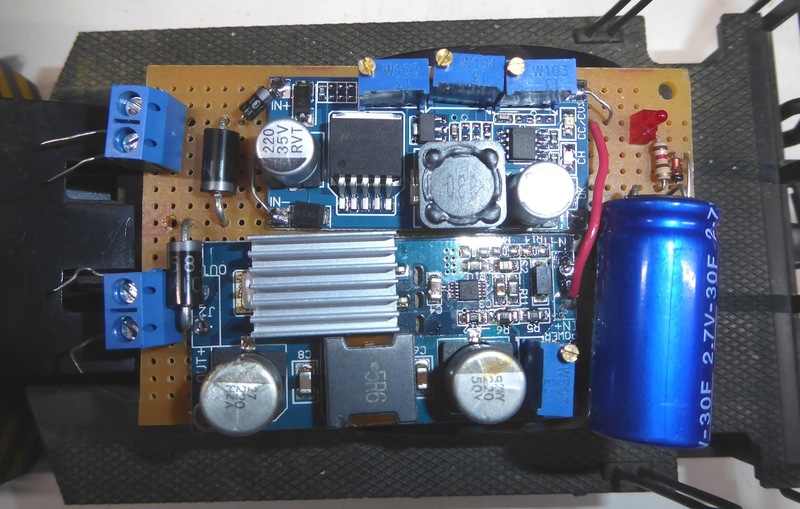 This fried not only the decoder, but also the LGB board that runs the lights and so on, and even some of the external electrics of the layout itself. I took advantage of that to do a full DCC installation, using a cheap Chinese voltage step-down board to supply an adjustable voltage to the cleaning motor. This could now be controlled using DCC with a relay to switch the power to it. It pulls about 2 amps, way beyond the auxiliary output of the decoder. It was operable again, but still needed clean track to work. It bounces along the track quite violently as the cleaning wheels oscillate against its movement, so much so that we christened it Mr Bouncy. The first year that I reopened the layout in spring, I had no choice but to clean the whole layout by hand. It really is a miserable job, and it persuaded me to try and make Mr Bouncy actually work. My first attempt was to fit NCE's own booster module. This uses six one-farad supercaps in series. Supercaps are amazing things. Until about 10 years ago, the largest capacitor you could get was about 100,000µF. And it was huge. Supercaps use a different technology making tens end even hundreds of farads perfectly practical. The only problem is that they run at very low voltages - normally 2.7V. The NCE booster turned out to be useless - it can only run at 15V, so I had to turn down my 18V track voltage. That upset several of the locomotives, and made smooth running much harder. And it just didn't have enough capacity for a loco as large as this. - in fact it had no effect at all. Nevertheless, supercaps are a very attractive solution to the problem. I thought about various ways to use them. I bought a bag of 10 30F units, and just for the sheer ridiculousness of it, a 350F supercap, which is about the size of a D-cell battery. Unlike a battery, though, it will cheerfully supply tens or even hundreds of amps for as long as it is charged. The problem is that supercaps have to be carefully managed. You can connect them in series, but even so you have to to do something to ensure that none of them go over the individual voltage limit. You also have to control the charging current - a discharged supercap will cheerfully pull hundreds of amps. That looks like a short circuit to the rest of the layout, and will just shut down the power supply. There's a very nice chip (the LTC3350) made to deal with exactly these problems, but it's not suitable for the kind of amateur construction I'm doing. For one thing it's only available in a PQFN package, which requires industrial machinery to solder. So I tried a different approach. 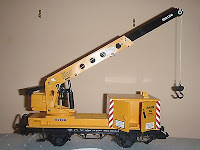 I bought an LGB crane wagon on Ebay, and fitted it with metal wheels and a connector to feed the loco. I figured that the extra wheels and longer wheelbase would allow it to find a way through dirty track. It helped a little, but not much. The cleaner would still not go round the layout, even when the track was in reasonable shape, without constant attention and the occasional prod. So it was back to the supercap solution. There are two problems: how to reduce the track voltage to something acceptable to the supercap, at the same time controlling the charging current; and how to bring that voltage back up to the 18V or so that the decoder is expecting. Electronics, Ebay, and cheap Chinese modules to the rescue this time. There are switch-mode power supply chips that do these jobs, and better yet, you can buy them assembled into modules for under $5. My solution used two of them: one, a buck converter, to reduce the track voltage to 5.2V to feed two 30F supercaps in series, with a constant current mode allowing the charging current to be controlled to 2A. They're in series because the boost converter, that turns 5.2V back into 17V supposedly requires 5V to operate. In reality it works fine down to 3V, but not 2.7V. The two of them fit side by side on a board along with the two supercaps and a few other components, and the whole assembly just fits into the available space in the front part of the loco, above the cleaning wheels and motor. A clever design would allow the two converters to be combined, using a single inductor - that's precisely what the LTC3350 does. But it would have taken a lot more of my time than just soldering a couple of modules to a board. The extra parts are quickly explained. The two big diodes on the left are 1N5422 5A Schottky diodes. They feed the higher of the input voltage and the output of the converter, to the output. The converter is set to slightly less than the track voltage, so its output is only used when the track voltage is absent. The smaller 1N4001 beside them ensures there is no reverse current through the step-down converter. The LED and zener at the top right show when the supercaps are charged close to 5.2V. There is a second supercap under the board, fitting into the gap between the wheels. One modification is required to the decoder, which isn't designed to work with a booster like this. The power input circuit, consisting of a bridge rectifier and a smoothing cap, needs to be separated from the rest. Luckily, in the case of my usual NCE decoder, this can be done by cutting just one track, and soldering wires either side of the cut to connect to the booster. First the heatsink must be removed from the base, by cutting the shrink-wrap that holds it in place. 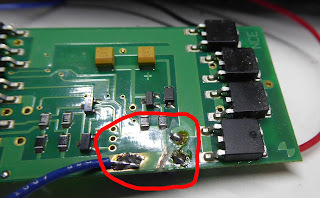 The picture also shows one of the extra wires soldered on. Once the modification has been made and tested, the heatsink is replaced and held in place with a new piece of one-inch shrink wrap. Finally it was time to test Mr Bouncy on the track. And this time, he worked perfectly. The track was filthy, unused for several months and black with oxide. I cleaned a short stretch, put Mr Bouncy on it and left him to charge - it takes about 30 seconds for the supercaps to charge fully. Then I set him slowly in motion. It was a pleasure to watch. The cleaner motor runs only on track power, so you can easily hear when power is interrupted. But the traction motor uses the booster. He will continue to trundle along slowly for up to about ten seconds, invariably enough to reach good power again and recharge. At first the cleaner runs only very intermittently, but on the second pass the track is a little cleaner and by the fifth pass it was running almost continuously, leaving beautiful shiny rails behind himself. A handful of times he did stop altogether, but the small current available through the dirty rails was enough to slowly recharge the supercaps, until he nudged along a few inches and then reached good power again. He can just be left to make a dozen or so circuits of the whole track, without any supervision at all. We're very close to perfection now. One remaining problem with Mr Bouncy is that the rails aren't cleaned evenly. For some reason a little oxide remains over the sleepers, but not in between them. Clearly the height of the railtop is not exactly constant. I think the solution to that is to attach a conventional "scraper" type rail cleaner behind him, to finish the job off, and I've just ordered one of those. It is a real pleasure to watch him going round and round, occasionally idling along under his own power but never coming to a stop. And much easier than doing the job by hand. Though our cat, Missy, doesn't really agree.